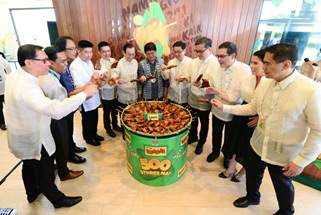 Mang Inasal, the fastest growing fast-food restaurant that serves the 2-in-1 sa Laki, Nuot-sa-Ihaw Sarap Chicken Inasal loved by everyone, celebrates a milestone as it formally opens its 500th store in the city where it all began - Iloilo. The well-loved grillery chain already gave Filipinos a preview of the milestone store located at the Iloilo City Center, West Diversion Road in Mandurriao, Iloilo City when it made a soft opening in April. 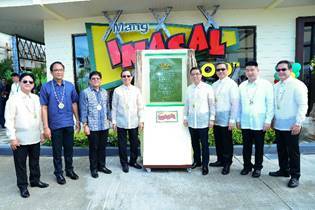 Mang Inasal kicked off the grand opening festivities on June 19, with the unveiling of a commemorative 500th store marker. It is made up of banana leaves encased in resin and arranged in Pintados pattern. The inscription takes pride of Mang Inasal’s growth in the past 15 years. Jollibee Foods Corporation (JFC) Chairman and Founder Tony Tan Caktiong, JFC Chief Executive Officer Ernesto Tanmantiong, and JFC Country Business Group Head for the Philippines Joseph Tanbuntiong led the unveiling of the ceremonial marker, the ribbon-cutting, and the ceremonial first bite of the iconic Chicken Inasal. They were accompanied by Guests of Honor Iloilo City Mayor Jose Espinosa III, Iloilo City Vice Mayor Jeffrey Ganzon, Mang Inasal founder and now Double Dragon Properties, Corp. Chairman and CEO Edgar “Injap” Sia II. “Mang Inasal is happy to share its milestone of reaching 500 stores with Filipinos who have been with us in our journey in the food service industry,” said Mang Inasal Strategic Business Unit Head Jojo P. Subido as he welcomed everyone to the celebration. Mr. Sia was honored with a banana leaf token to pay tribute to his visionary leadership. Mayor Espinosa expressed appreciation to MI for its decision to go back to its roots. The 500th store is the 17th Mang Inasal store in Iloilo City. JFC Chairman and Founder Tony Tan Caktiong, JFC CEO Ernesto Tanmantiong, and JFC Phil Country Business Group Head Joseph Tanbuntiong (Center, L-R respectively) unveil the commemorative store marker of Mang Inasal’s 500th store at the Iloilo City Center. Flanking them are (L-R) Iloilo City Vice Mayor Jeffrey Ganzon, Iloilo City Executive Assistant for Social Affairs Dominador Co, Iloilo City Mayor Jose Espinosa III, MI Founder Injap Sia, and SBU Head Jojo Subido. The 500th store is unlike any other Mang Inasal branch. Its distinct exterior displays a fresh and contemporary appeal but without losing Mang Inasal’s unique Filipino sentimentality. Inspired by houses built in the post-war era, the milestone store is designed to have a simple, functional, and commonplace aesthetics, according to JFC Corporate Global Real Estate Chief Real Estate Officer, William Tan Untiong. Meanwhile, the store’s interior styling features pieces that exude a touch of home to embrace the provincial, homey grillery ambience that Filipinos have grown accustomed to at Mang Inasal. Colorful buntings hang on the high ceiling and tribal Pintados-patterned walls evoke cheerful Iloilo festivity. Murals that exhibit vibrant infographic and geometric and texture elements also beautify the store’s interiors to highlight modern Pinoy artistry. Meanwhile, the employees of the Mang Inasal 500th Store are also dressed up in a new set of uniforms designed by renowned fashion designer Rajo Laurel.